Chocolate lovers in the Northwest can enjoy a delicious "staycation" in Seattle on July 13th! The first major chocolate show in the Northwest this millennium takes place at the SEATTLE LUXURY CHOCOLATE SALON on Sunday, July 13th, 2008. Chocolate aficionados, fanatics, lovers and addicts can taste & experience the finest in artisan, gourmet & premium chocolate in one of the world's great culinary metropolitan areas. Featured chocolatiers and confectioners include Amano Artisan Chocolate, Kekau Chocolatier, Cocoa Chai Chocolates, Petit Noirs, Guittard Chocolate, Poco Dolce, Theo Chocolate, Blissful Brownies, Island Angel Chocolates, Alma Chocolate, Lula's Chocolates, Intrigue Chocolates Co., Andy's Handmade Chocolates, Fiori Chocolatiers, Dilettante Chocolates, Posh Chocolat, GrendelSweets Handcrafted Chocolates, Oh! Chocolate, Decadent Tastes, Cadeaux Chocolates, Emily's Chocolates, Cosmic Chocolate, Sweet Beauty Organic Chocolate Spa, Sol Rouge Wines and more. The Seattle Luxury CHOCOLATE SALON is Sunday, July 13th, 2008, at the Bell Harbor International Conference Center, 2211 Alaskan Way, Pier 66. 11:00 a.m. - 5:00 p.m.
Tickets are $20 for adults, $17.50 in Advance (recommended). For Advance Ticket purchases, Salon information, updated chocolatiers and other exhibitors, or for the Menu of events, go to http://www.SeattleChocolateSalon.com. 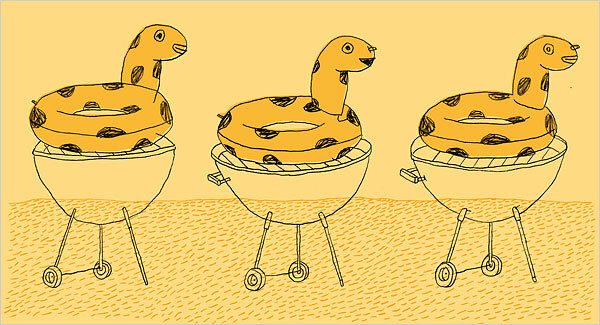 The New York Times has an interesting article about the some of their cookbook picks for Summer 2008. They also say that frankly cookbooks are mostly failures. And yet, publishers churn them out and people buy them --- or at least, some of them. The truth is that most cookbooks are also commercial failures as well. Chefs see their names on the cover, do a few book signings, maybe a brief self-funded tour, and then it goes into to the remainders racks. It is an immutable truth of the food world, right up there with watched pots never boiling: most cookbooks are failures. You can cook with joy and distraction or follow the instructions to the letter, like a terrified parent responding to a detailed kidnapper’s note. Too often the result is mediocrity, food that just sits there on the plate, undercooked, overcooked, not rich enough, broken or, worse, boring. This is a depressing state of affairs, but hardly surprising. There are a lot of cookbooks in our hungry world, and they keep on coming, every season, thick and glossy and unwise, to taunt the home cook and restaurant enthusiast alike. And we buy them. Cookbooks were a $530 million business in the United States in 2007, according to Michael Norris, a senior analyst for Simba Information, a market research firm. Nearly 14 million books about cooking and entertaining were purchased in the United States in 2007, according to Nielsen BookScan. The trend has been basically upward since at least 2002. On the basis of this summer’s offerings, it shows no signs of abating. Yet there are still some good cookbooks out there, amid the fallen soufflés and curdled sauces. Even in the bad ones, there are some decent recipes, excellent observations, some help for the yearning cook. And in between, there are subtle lessons to be learned about what to look for when you’re at the bookstore pawing through some celebrity chef’s latest tome. By the way, his list includes THE RIVER COTTAGE COOKBOOK, THE RIVER COTTAGE COOKBOOK, and IZAKAYA: The Japanese Pub Cookbook. Unfortunately, since it's not a new book, the cookbook/travel guide/cultural essay CHOCOLATE FRENCH was not included (this time!). The lineup for the 1st Annual Seattle Luxury CHOCOLATE Salon on July 13th includes chocolatiers and confectioners such as Amano Artisan Chocolate, Kekau Chocolatier, Cocoa Chai Chocolates, Petit Noirs, Seattle Chocolate Company, Guittard Chocolate, Poco Dolce, Theo Chocolate, Blissful Brownies, Island Angel Chocolates, Alma Chocolate, Lula's Chocolates, Intrigue Chocolates Co., Andy's Handmade Chocolates, Fiori Chocolatiers, Dilettante Chocolates, Sweet Beauty and more.